436 pages | 1 B/W Illus. Most developed economies are characterized by high levels of inequality and an inability to provide stability or opportunity for many of their citizens. Mainstream economics has proven to be of little assistance in addressing these systemic failures, and this has led both scholars and students to seek alternatives. One such alternative is provided by Marxian economics. In recent decades the field has seen tremendous theoretical development and Marxian perspectives have begun to appear in public discourse in unprecedented ways. This handbook contains thirty-seven original essays from a wide range of leading international scholars, recognized for their expertise in different areas of Marxian economics. Its scope is broad, ranging from contributions on familiar Marxist concepts such as value theory, the labor process, accumulation, crisis and socialism, to others not always associated with the Marxian canon, like feminism, ecology, international migration and epistemology. This breadth of coverage reflects the development of Marxian economic and social theory, and encompasses both the history and the frontiers of current scholarship. This handbook provides an extensive statement of the current shape and future direction of Marxian economics. 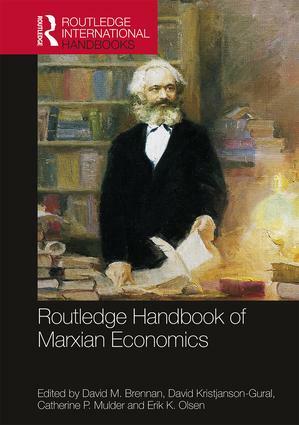 The Routledge Handbook of Marxian Economics is an invaluable resource for students, researchers and policy makers seeking guidance in this field. It is designed to serve both as a reference work and as a supplementary text for classroom use, with applications for courses in economics, sociology, political science, management, anthropology, development studies, philosophy and history. David M. Brennan is Associate Professor of Economics at Franklin & Marshall College in Lancaster, PA, USA. David Kristjanson-Gural is Professor of Economics and Senior Fellow of the Social Justice College at Bucknell University, PA, USA. Catherine P. Mulder is Associate Professor of Economics and the Program Director at John Jay College—CUNY, USA. Erik K. Olsen is Associate Professor of Economics at the University of Missouri—Kansas City and Research Fellow at the Rutgers University School of Management and Labor Relations, USA.